Starting today (February 16th), you can now use your Clipper card on the Santa Clara Valley Transportation Authority or better known as VTA. While VTA is now participating in this program, they offer the standard benefits to their passengers with one exception, no day passes (for now). One of the best benefits of VTA joining Clipper is great inter-agency transfers with Samtrans, Caltrain, AC Transit, Dumbarton Express, and BART. To read more about the inter-agency transfers, click here. 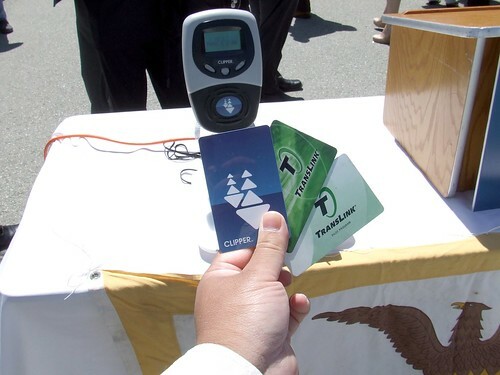 All passengers must tag their Clipper card on the vehicle or the light rail platform. This is regardless if you have e-cash, valid pass, or valid inter-agency transfer. Click here to learn how to properly tag your card and minimize delays. Light rail customers have two hours to complete their journey. Fare inspectors have card readers and can verify it. Light rail customers needing to transfer to another train to complete their journey should NOT tag their card on the platform reader of their transfer station. This will result in being charged for a second ride. If you ride an express and have only partial credentials to ride (e.g. local fare credit for inter-agency transfer or a non-express pass), you need to have ample e-cash to make-up for the difference. For example, if I have a two+ zone Caltrain pass, I get a local fare credit, but riding an express bus will also deduct $2 from my Clipper card to make-up the cost difference. You can't pay the cost difference in cash. While Clipper is getting more in-person vendors to be able to add Clipper value, there are limited locations to add value in-person. Consider autoload as an option or mark your calendar for occasional visits to load funds. You can also do it online or by phone, but be warned of the "five day rule." As many earlier news reports have said, this completes the connection of all major Bay Area transit agencies to have a one card system. It makes it simpler for customers to have multiple passes and tickets loaded onto one single card, and no fumbling for dollar bills and exact pocket change to pay for fares. I believe VTA is one of the most generous transit agencies in the Bay Area with their inter-agency agreements, and with further expansion of the Clipper program and more agencies joining the consortium, people will appreciate the easy transferring from one agency to another. We all can agree that expansion of Clipper to the smaller agencies like Vallejo/BayLink, County Connection, WestCat, and Union City will be vital to making the entire system work as one. But surely we should try to get private transit agencies like the Blue and Gold Fleet's commuter service to Tiburon to also join the consortium too. Lastly, I think many of us can also agree there are a few bugs and downsides to Clipper. A recent KTVU report says Caltrain conductors experience issues half the time, and there's the occasional Tweet I encounter of people confused of the rules or having card issues. I may not have all the answers and some changes takes the power of a transit agency's Board of Directors, but I still have faith this program will be successful. How soon until I can pay for snacks with my Clipper card at my local 7-11? I feel the need for a Slurpee.